If you have any of these cards, I am very interested in taking them off your hands for a reasonable price. I'm from the US and will pay via Paypal. Thanks! Some of you still haven't paid and there's one payment I had with no name with two people listing as payment. Make sure it was sent to whalesales@aol.com. If you're name is in light green or blue with a total you're good to go! :) payments to whalesales@aol.com with your username and whatnot. The Auction ends tonight at 11:59 EST. Here she is the bell of the ball and my all time favorite pokemon *drum roll* DELCATTY!!!! She is so super cute and I love her and she is going to be super hard to part with. But I know she will go to a good home. I made sure to take pictures of all of her sides so that you could take in all of the awsomeness and to check out more pics go to the auction link ;). Her measurements are 8.5" tall and 5" wide. Also here is an updated picture on my oops skitty. Just wanted to thank everyone who helped convince me to finish her because I was just gonna set her aside and miss out on all the cute she is turning out to be. I will not get to work on her any over the weekend, but sometime next week I will be able to finish her. She still needs her purple ball of yarn (that she is laying on her back playing with) and obviously her tail. Hey everyone! Well, it seems my search for an N Dot Sprite pin will continue! In the meantime, I will have my extra pins available for sale for anyone who's interested! I only accept PayPal payments at this time--sorry for any inconvenience this may cause :( And no eChecks, please! I'm going to contact the people who showed buying interest in my previous post first, but if they decline I'll let anyone who wants a pin know! All sold! :) Thanks for looking! Here it is! The GB of a century. So. Here are the rules. -I will not be claiming anything! -Comment to be put on the list! -There will be three payments. Payment 1 will be the price of the plush + fees. Payment 2 will be shipping to me, and Payment 3 will be shipping to you. This thing ends pretty soon, but I am confident that we can make the claims in time! THE PRICE WILL BE $55 EACH BEFORE SHIPPING AND FEES! It seems that things are slow in the world of Lugia plush collecting.. with only a few left to go, I am probably going to be waiting a while before I find the ones I need. There are a few figures I am considering getting but even then, what comes next? What happens if I finally do complete my collection?? I am going to make a wants list on my Livejournal page soon enough as I'm not using it for anything else! Well that's all from me for a while as my new collections won't begin until after May (kinda busy saving money until then). I'll be lurking, in the meantime please tell me about your sudden collection outbursts ^v^ I'd love to hear! THE CHARMS HAVE ARRIVED! I am SO EXCITED! I knew we paid for fast shipping but I didn't realize they would make it here THAT fast. Not sure if I all actually wearing this but I thought it was cute. XD! NOW! The reason for this post since I could've just contacted the GB people individually with that information. Change of plans. I decided to cancel the second GB. Sorry. Also, can anyone tell me what these are? I think they're stickers, but I don't know what they're from or how much they are worth. apparently they've been in my drawer unopened for years. Just opened them today to see what pokies were in there. I bought 5 campaign packs for Dark Rush! :D I got all of the cards I wanted from the series except 8 (5 of which are ultra rares that I didn't expect to get). I will be trading and possibly selling the remaining cards. I did get two ultra rares...both of which I am trading. lol. I was trying to look up pricing on my Dark Rush cards and I stumbled across something. I might have gotten an extremely rare card without noticing it. 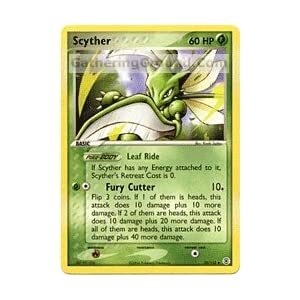 This card....is apparently worth $60. 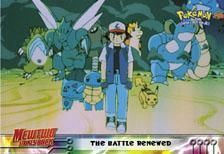 O: It is a card I overlooked when I was going through the packs...except to wonder why a trainer card was holo. I'm....in shock...this is easily the most expensive card I have ever owned. I am willing to trade/sell this card, so if you're interested...let me know! ^^ I have already made arrangements to trade/sell this card. Hello again. Today I went to the mall, not really intending to but any pokemon but I had to spend $11 more to use my $15 off (so I basically got it for free). My early Bday present was an Oshawott plush bag (don't get him untill my actual bday though) So I'm super excited about it. 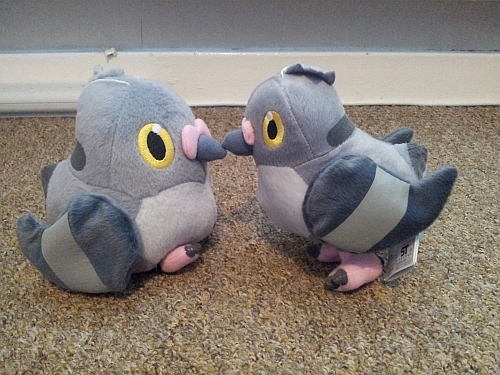 Also on the way are a 13" Piplup Toyfactory plush and an Empoleon plush (hope the person received payment for him). also does anyone know if it is possible for a pikachu to play a saxophone? and what are these guys worth and would they be considered a grail? 11 hours left on this so get your bids in! is anyone interest with this?? Its been a really really long time since I've posted here, so I think its time to reintroduce myself! My name is Shannon, but I usually go by "Sapphire" or "Hotwingforgery" on the internet. 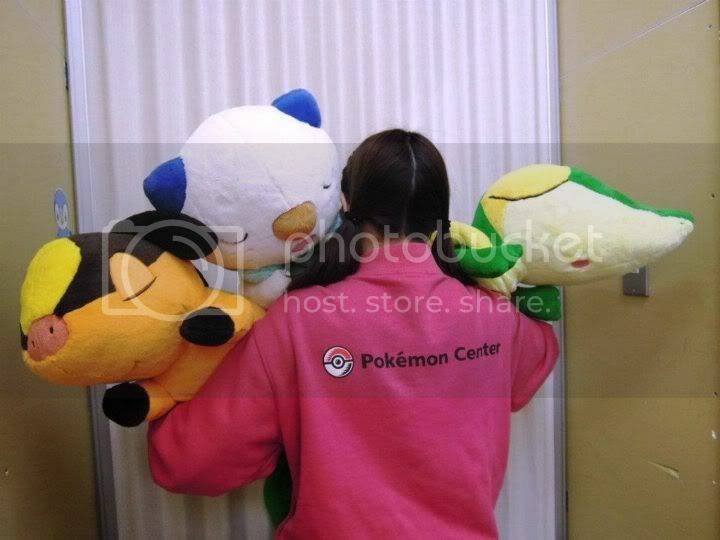 I mainly collect pokedolls, plush and zukan, and I have way too many favourite pokemon! I really love Scolipede, Mienfoo/Mienshao, Dewott, Darumaka, Eevee/Vaporeon/Leafeon, Mew, and the shinx line a whole lot! My love is definitely not limited to just them though! I work as an artist/sewer and love drawing and sewing all sorts of pokemon things when I have the free time to! Anyway, i recently moved out of my parents place, and into a sweet apartment with my boyfriend, who is also a pokemon fan! He likes aipom a lot so there are way too many creepy monkeys in my life now, haha! My current collection under the cut! Also its been a long time, since I offered any customs on the community, but I recently got a new sewing machine and have been making SO MANY PATCHES. And I would love to offer some to the community! Thanks for looking guys! I hope you enjoyed my collection update! So I recently bought packs of stickers featuring some lovely art I haven't really seen before. I kept some for myself, but I figured I would sell the rest of them to the community! They feature a variety of pokemon ranging from really popular pokemon (Eevee, Leafeon, Glaceon), pokemon that don't have much merch (Skuntank, Mantyke, Tangrowth) to the typical Piplup and Pikachu! JUST;; LOOOOK AT THEM, RNT THEY PERFECT!?!?!??! I cant WAIT FOR GIN TO PICK EM UP! They were TOTALLY as awesome as expected! Is anyone interested in any of the following? Snorunt zukan W/or Without froslass. (has both versions) perfect condition! European version of Pokemon Platinum for DS. Works Good! 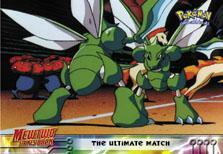 Grass plate arceus UFO. Awesome condition! If u feel interest/been looking for any of these things, really, feel free to just throw me an offer! I am looking for Bulbasaur and Chikorita! Either the top screen has opened up a secret portal to a dark dimension, or my DS is ruined. Small Sales and Offers! Rollers, Kids, Clearfiles, Flats and more! So, I recently bought a Turtwig pokedoll from a trusted seller in our local web store. I was really excited because I had been looking for one that comes with the hang tag. I have bought from that seller before and they were all legit, but this one.. I have a concern that it might be a bootie ;_; The quality isn't too bad at all, but I noticed there's quite a lot of difference of this one with my old Japanese release (with tus tag only)... but I just wanna make sure that before I bring this matter to the seller, since he has been nice so far. I am proud to present my amazing umbreon pokedolls!! I finally bought a minky umbreon!!! 2010 Velboa US WA Release. And here's my collection update!! Now the only Umbreon pokedoll I'm after is the 2007 release!! 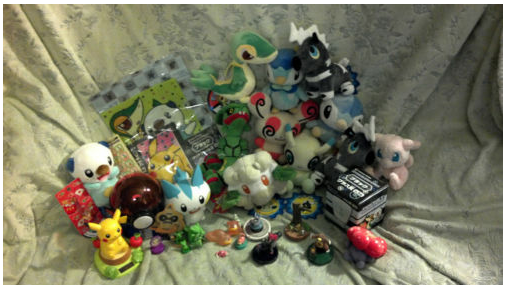 Box of Pkmn goods for sale! Sorry for the dud post earlier, the mobile LJ app still hates me apparently. I've decided to sell all my things in a lot to better free up space and also because I have been compulsively buying too much and need to make up for it. ^ ^" Photos under the cut! XL Girls blue Hot Topic shirt. Worn once, great condition. XL Boys grey ToysRUs shirt. Worn once, great condition. Everything is in great to near mint condition unless otherwise specified. Any questions feel free to ask and if you want more pictures or more details about a certain item. I am looking for 200$ excluding shipping and fees. The price is negotiable though and I am open for offers! First collection post of 2012! I figured it's about time for me to do a collection post and short re-intro again. I'm Kristin, AKA PacificPikachu, and I've been a member of this community since a few minutes after it began! I'm twenty-three, going on twenty-four years old, and I live in northern California. In the years I've been on this community, my collection has grown from a small pile of plush to what my family and friends sometimes refer to as a "museum." It's amazing to see how far I've come! I've also made a number of friends from all around the world, and learned more than I ever thought I could know about Pokémon merchandise. I feel so proud to be a part of this community! I have a large number of collections, as you will see! My most serious collections are surfing Pikachu, Umbreon, 1/1 scale plush, and Pokémon animation cels, but I also collect Mew, Eevee, Unfezant and family, Minccino and sometimes Cinccino, Chikorita, Buizel, Togekiss, Lapras, and...um, a lot more than that. Thank you to everyone for checking out my collection! I'm always happy to answer questions. I can grab more pictures of anything, too, just be aware it might take a few days because I'm constantly going back and forth between my two homes, but spend more time at the house with the real animals versus the house with the collection. I hope you all enjoyed, and I wish the members of pkmncollectors a wonderful 2012!